This modern hanging chaise lounge chair is the most perfect tool for you to rest and relax in your garden ,patio or yard. 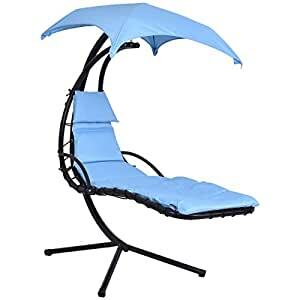 Its unique design with heavy-duty powder-coated metal frame , thick foam-filled polyester cushion and removable canopy umbrella provide you extreme leisure experience in comfort. Moreover, its modern & innovative appearance make it also be a great addition to your outside living space.